Dry January is well and truly behind us, 71% of adults admit they eat ice cream as an indulgence opting for taste over calorie counting. Speakeasy is hot on the heels of this trend with the launch of three brand new flavour collaborations with award-winning craft alcohol brands, Lazzaroni and Conker Spirit. Launching in Ocado in mid February for £5.99, Speakeasy Ice Cream is redefining alcohol ice-cream. Indulgently creamy and with each flavour made with natural ingredients and featuring a single alcohol as its centrepiece, Speakeasy offers a unique twist on traditional luxury ice creams. 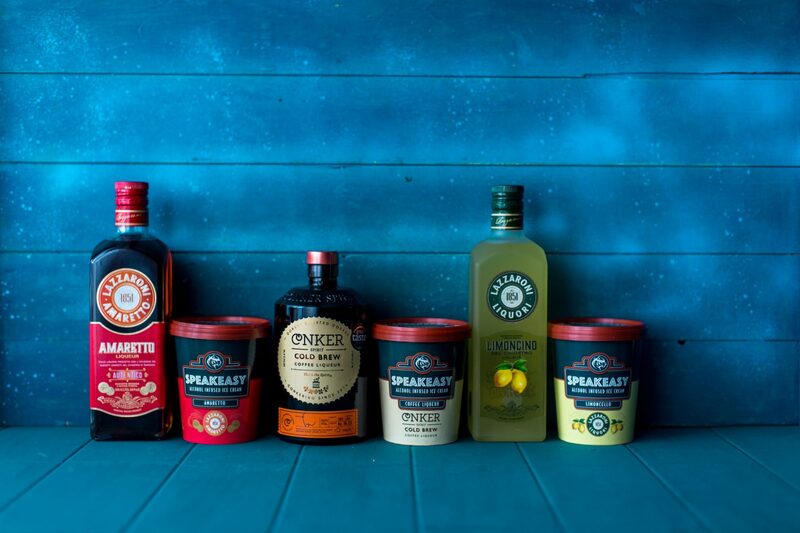 With 49% of adults interested in ice cream featuring alcohol, Speakeasy is the only UK brand, dedicated to making alcohol infused ice cream, that is available in the retail market. Founder of Speakeasy Ice Cream Jane Woodhead comments: “The response to our alcohol infused ice creams has been amazing. Our unique approach ensures the highest quality and flavour profiles through collaboration with our drinks partners. We are delighted to be adding the new range to Ocado and this is a culmination of extensive team work between us and Lazzaroni and Conker Spirits’. Amaretto (ABV 1.2%)– Lazzaroni has been creating its authentic Italian Amaretto since 1851, made and bottled in Saronno – Italy. The recipe is an old and unique family creation, deriving its flavour from an infusion of the famous “Amaretti del Chiostro di Saronno” cookies. The resulting ice cream flavour has a soft and sweet balance, with the instantly recognisable Amaretto flavour. Coffee Liqueur (ABV 1.1%)– Conker’s delicious Cold Brew Coffee Liqueur is a complex, dark and fruity brew made from the very best speciality Brazilian and Ethiopian coffee beans. The Cold Brew Method eliminates the acidic, bitter elements of the beans and the resulting liqueur is smooth and dark with natural vanillas and caramels. The exceptional flavour of the Cold Brew Liqueur pairs perfectly with the creaminess of Speakeasy’s ice cream promising a real treat for coffee lovers. Limoncello (ABV 1.1%)– The distinctive and refreshing citrus flavour of Limoncello is the centrepiece of this delicious and luxurious ice cream. Lazzaroni’s Limoncino is made according to an original recipe from the last Century, using only the best Sicilian lemons. The unique flavour of this Limoncello creates a fabulous ‘sherbet’ sensation to the ice cream. Speakeasy has seen great success with its breakout Ableforth’s collection including three delicious flavours Ramos Gin, Spiced Rum and Cherry Brandy and looks forward to seeing the response from customers with the new flavours. Speakeasy can be found not only in homes across the country but in restaurants too, with top chefs using these ice creams in inspiring ways, enhancing their dessert menus. The family-run business, which launched in 2017, has taken its inspiration from the Speakeasy hideaways of the prohibition era with the famous ‘blind tiger’ as its emblem. The beautifully crafted and decadent ice creams reflect the style of prohibition times; indulgent but with a hidden secret, a touch of alcohol! Speakeasy Ice Cream: Indulgence. Redefined.